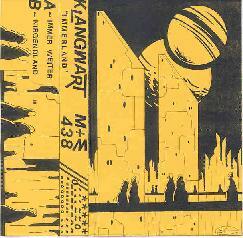 Klangwart is the duo of Markus Detmer and Timo Reuber from Germany that play ambient electronic soundscapes. They don't set themselves much apart from other electronic musicians, but do manage to keep their music interesting by avoiding the goal of relaxing the listener with sappy picturesque images of flower fields and feel good vibes. The cassette consists of two side long pieces. "Immer Weiter" paints a dark, machine like vision of space. The journey takes place in the very heart of the spaceship's engine room. A little window permits a view of the cosmos that alternates between quiet blackness and utter chaos. Varied, and often distressing, sounds are introduced throughout that succeed in maintaining the floating aspect of electronica but not the relaxation. Things get a bit intense as the volume level goes up, bleeps and burps abound, and the graveyard shift in Metropolis goes into full blown production. "Nirgendland" begins by creating a calm atmosphere with simple repeating melody lines. After a while we hear some tribal beats that soon develop into a pulsating, multi-layered soundscape that once again carries the listener into the more haunting regions of space. It builds just a touch of intensity and then winds down by returning to the earlier tribal rhythms. I like electronica that has that has an industrial feel and creates dark disturbing atmospheres, and in this respect Klangwart succeeds.